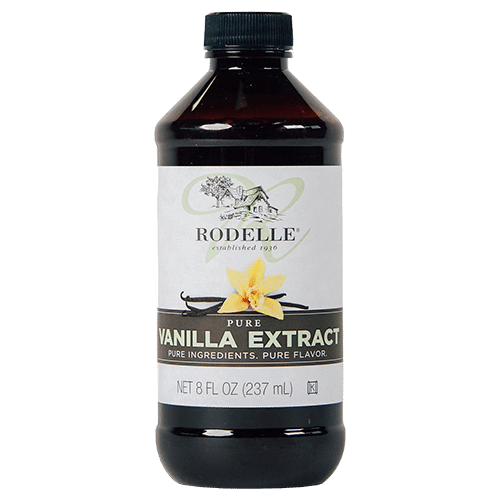 Rodelle Pure Vanilla Extract is our signature vanilla product. Our pure vanilla extract is produced from the highest-quality Bourbon vanilla beans. Our percolation process produces a superior vanilla extract containing one of the highest vanillin levels in the market. Made with pure natural hand selected vanilla beans, Rodelle Pure Vanilla Extract offers a deep, rich, natural flavor. Rodelle does not utilize peanuts or tree-nuts on its production floor or in its products. Contact us for any other allergen questions!